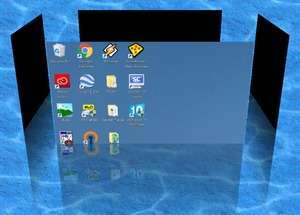 Shock 4Way 3D is an addon desktop enhancement program which takes a nod from the Linux community, like Apple did with Mac OS X, and installs a window management system. The overall usefulness of this program can be extensive. At least for the fact that it allows you to switch between multiple desktops with a transition effect. The desktops can be ordered on the faces of a cube and you can switch between the different desktop with key combinations. Version 1.29 is a freeware program which does not have restrictions and it's free so it doesn't cost anything. For security reasons, you should also check out the Shock 4Way 3D download at LO4D.com which includes virus and malware tests. Additional screenshots of this application download may be available, too. Shock 4Way 3D has a presence on social networks.